There’s a few weeks until Just Cause 3 explodes on to our gaming machines, and for most of that period we’re going to be spending our time exploring Victorian London, stopping robotic takeovers in the near future, surviving the wasteland, or just in a galaxy far, far away. We better give Rico Rodriguez his spotlight now then. Set to storm the island of Medici and save the populus from the tyrannical General Di Ravello, Rico’s all about the destruction and decimation of enemy forces through offering the player a unique suite of tools and weapons that let you play as you want. Driving, gliding, flying, running, winching, parachuting… you name the method of locomotion and you can find it in Just Cause 3, and then couple it with being able to fire rockets at the same time. Its style of over the top, ridiculously fun action isn’t really found anywhere else, and since the demise of Pandemic Studios and their Mercenaries franchise, there’s no open world one man army sim to challenge for the crown. Check out the trailers below for a feel of what it’s all about, which really is just blowing things up in as many interesting ways as you can figure out. How about a tour of the amazing island environment the Avalanche Studios team have created? Load up the below video on your smartphone or tablet to get a 360 degree view of a wingsuit ride, or better yet, download the VR app from the iTunes or Android for a more immersive experience (you’ve made your own Google Cardboard, right?). 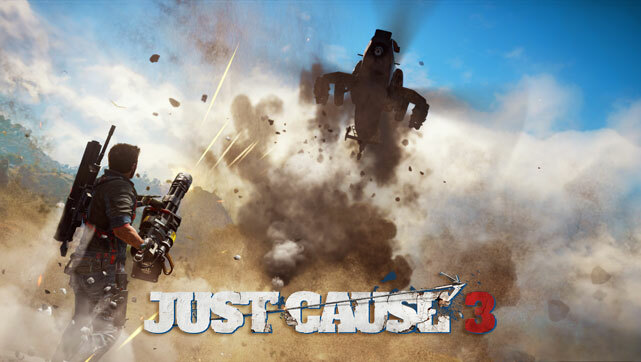 Want to know more about the story that will unfold in Just Cause 3? Check out the below for a rich and moving cinematic presentation of what’s led Rico up to this point in his life, how his mother and father influenced his love of poetry and flower petal pressing, and what his favourite architectural period is. Not really, it’s just more ‘splosions. Not had enough yet? Here’s one last video for now, a dev diary covering the how the story has been crafted, the character performances and the philosophy around letting the gamer try cool things. This is a must buy on the Codec Moments list of titles to pick up before the end of the year, get ready to set the world on fire on 1st December 2015 across PS4, Xbox One and PC.